If you have old, inefficient windows in your home, the time will come when you’ll need to replace them. Old windows that are drafty and leaky cause a sacrifice in comfort, cause your HVAC system to work overtime, and cause your utility bills to increase. 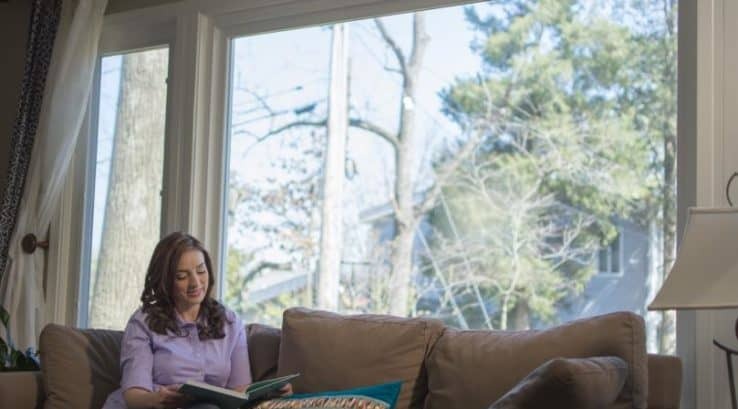 When you begin to research replacement window options, you’ll quickly see there are a lot of factors that come into play. Material, manufacturing process, durability, maintenance, energy efficiency, aesthetics, and cost all influence your decision. Two of the most popular window materials – vinyl and fiberglass – have pros and cons in each category. One of the biggest reasons homeowners replace old windows is to improve energy efficiency. Durability between vinyl and fiberglass is about equal. Neither will rot or warp like wood windows. While it’s true that fiberglass handles changes in temperature a bit better than vinyl, the winter vs. summer temperature extremes in the mid-Atlantic can be handled equally well with vinyl windows. And keep in mind that fiberglass windows are fastened together at all joints, which can weaken over time. Quality vinyl windows are fusion welded, giving them increased strength. Vinyl windows are engineered with a series of internal chambers within the frame. This creates a thermal barrier that increases the insulating properties, unlike fiberglass which is just a solid material with no insulating chambers. Because fiberglass windows are more complicated to manufacture, this means they’re available in limited sizes. Vinyl’s ease of manufacturing gives homeowners virtually unlimited choices when it comes to size, especially when ordering from manufacturers who custom build each window. Installing windows in the correct size prevents the need for wood shims, additional insulation, and other fixes to make a window fit in a different sized opening. The tight fit of a properly-sized window translates to increased energy efficiency. While the fiberglass window manufacturing process decreases the size options, it also tends to affect their cost. Fiberglass windows are priced higher than vinyl windows, though lower than wood windows. Manufacturing vinyl windows is an easier process, therefore making them more affordable. Vinyl windows are virtually maintenance free. Since the frame color is mixed in with the vinyl material before manufacturing, you won’t see any fading, chipping, or peeling of the color over time. Fiberglass windows require more maintenance, including periodic repainting. Whichever frame material you choose, you also need to pay attention to the other components. Window glass plays an important part in the window’s overall energy efficiency. A double paned window has gas trapped between the two panes, making them much better at insulating than single paned windows. Low-e coatings decrease heat transfer between the indoors and outdoors, while also reducing harmful UV rays that can fade furniture and flooring. When in doubt, look for the ENERGY STAR label. ENERGY STAR windows meet or exceed energy performance rating criteria so you know you’re getting the most bang for your buck. When considering vinyl vs. fiberglass windows for your replacement project, carefully weigh the pros and cons of each material. Look at the energy efficiency, durability, maintenance, and cost and see how those factors fit in with the overall goals of your replacement project.